From BYU Studies: After the death of the Prophet Joseph Smith on 27 June 1844, anti-Mormon violence subsided briefly as the mob element awaited the expected demise of the Church. When the Church did not fall, persecution resumed, officially taking the form of the repeal of the Nauvoo Charter. The Charter, approved by the Illinois Legislature in December 1840, provided the citizens of Nauvoo with, among other things, the right to regulate their own police protection and to punish lawbreakers. In the ensuing months, the Mormons claimed that certain disreputable characters were indeed taking advantage of the situation. Facing this uneasy state of affairs, the ecclesiastical leaders felt compelled to find some means of maintaining discipline in the city streets. Not wanting to resort to extra-legal activities and being aware that their priesthood authority did not apply to any but their own people, they sought an alternative solution. If some plan were not found, they would either have to live with the consequences or resort to their own mob rule—where power prevailed but trouble ensued. In January 1845, the Nauvoo charter was repealed. This left Nauvoo without a city government, and without a legal militia or police force. This was done despite the warnings of members of the state legislature that law and order would break down. . . .They tried every means they could devise to bring trouble upon Nauvoo, frequently a party would land from a steamboat and come into the city, commit their deviltry, and return to the boat and leave again, well knowing we had no law to protect us since the city charter was taken away. The twofold goal of the groups was to (1) care for the poor, and (2) keep the streets of Nauvoo safe, especially at night. The bishops and deacons assigned to this type of activity evolved into what became known as the "whistling and whittling brigades." The City of Joseph's elders ingeniously met the increasing flood of Gentile undesirables by organizing the boy population into a "Whistling and Whittling Brigade." Suspicious strangers immediately would be surrounded by groups of boys, armed with long-bladed jack-knives and sticks. Whichever way the suspect moved, the boys followed; whistling and whittling as they went. Not a question would they ask, not a question would they answer. They were too small to strike individually; too many to battle collectively. When they descended on a hapless stranger, they hugged his presence like vermin, until in exasperation he was glad to take hasty leave from the abode of the Saints. "Children also helped build Nauvoo. If they were old enough, they helped take care of the animals and the farms, gathered wood and berries, and helped make cider, soap, and candles. They also went to school. One group of young boys helped in a unique way. Many criminals came to Nauvoo, and the Saints did not want these people in their city but did not want to use violent means to get rid of them. A group of boys was organized into a “whistling and whittling brigade.” Whenever the boys saw a suspicious stranger on the street, they would surround him and walk along with him. They would not speak, but would just whistle and whittle as they followed the stranger wherever he went. It would be annoying and frustrating to the stranger, but he could not fight all the boys at once, so he would soon leave town (see enrichment activity 2). (Lesson 33: The Saints Work to Build Nauvoo, the Beautiful)"
The Sunday School lessons sugar-coat the actions of the "Whistling and Whittling Brigade" to make it appear as if it was a bunch of young boys innocently and courageously making criminals leave town in a harmless manner. Of course in reality, the brigade was actually older boys, and they whittled with Bowie knives. They didn't annoy people out of town, they terrified them out. And it wasn't criminals, it was members who were no longer in the church's graces, and many strangers, not just suspicious ones. It seems to me that here Mosiah Hancock is saying that taking a knife and gutting a man and throwing his corpse into the river is justified if he has been accused of "lurking around the Prophet's premises" after dusk or asking uncomfortable questions. Yeah, if he's asking questions, it's okay to draw and quarter the dude. Stupid fop, that'll learn 'im! "Justice" being dispensed by knife wielding adolescents is a good system? I think not. Imagine a group of teenage gang members following you around every you went, playing music on their speakers, and always playing with aluminum bats, switchblades, and other such implements. Now imagine that the local police wouldn't do anything about the street gang, and in fact seemed to encourage it. Now imagine that the only reason the street gang was harassing you was because you didn't go to their church, or had stopped going. Yeah, how nice do these kids seem now? This intimidation was exemplified by the activities of a band called “the whistling and whittling brigade” that bullied innocent victims out of Nauvoo. Hawkins Taylor, Sheriff of Lee County, Iowa, explains how this brigade operated when he sent officers into Nauvoo to serve writs for the purpose of reclaiming stolen property from the Saints. “Several hundred men were hired to work on the temple. These men had to be fed. To do this, they lived on the Smith (stolen) cattle, sheep, and grain of all kinds, all taken to the temple, consecrated and then given to the Lord's workmen on the Lord's temple… The people [farm owners] had no remedy. The Mormons were the majority in the county and had all the officers of importance. If a writ was taken out, the officer was whittled out of the city. “The process of whittling out an officer was as follows: A great tall man by the name of (Hosea) Stout was the captain of the Whittling society, and he had about a dozen assistants. They all had great bowie knives and would get a long piece of pine board and get up close to the officer and pretend to be cutting the pine board, but would cut over it and cut near the officer. In the meantime, small boys would get tin pans, old bells and all sorts of things to make a noise with and surround the officer. No one would touch or say a word to him, but the noise drowned all that he would say. Hallwas & Launius 1995, pp. 54–55 Link: Link is here. According to Hawkins Taylor, Sheriff of Lee County, Iowa, "a great tall man by the name of Hosea Stout was the captain of the Whittling society, and he had about a dozen assistants." 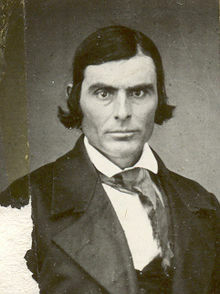 Hosea Stout was a member of the Danites, a vigilante group created to protect the Church at all costs. With Stout as head of the Whistling and Whittling Brigade, it doesn't seem like this organization was as innocent and honorable as the Church lesson manuals teach.